The Exo Terra Light Units are the most flexible solution for fitting all types of linear fluorescents tubes onto any type of terrarium. All units come with a double fitting to enable the combination of different Repti Glo bulbs in order to obtain the right light output depending on the species and climate. The Exo Terra Light Cycle Unit also has a timer and a linear fluorescent bulb dimmer built in. The Exo Terra Light Cycle Unit Electronic Dimming Terrarium Lamp Controller, is an electronic ballast, a timer and a dusk - dawn simulator in one. 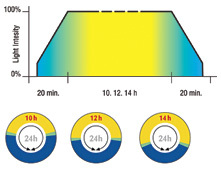 The timer can be set for three lighting periods: 10, 12 or 14 hours. When a daytime cycle starts it will take about 30 minutes to bring the light output of the bulb to 100%, simulating a natural dawn period. At the end of each daytime cycle it will take again about 30 minutes to go from 100% light output to 0%, simulating a natural dusk period. This is less stressful for the animals and even stimulates breeding behaviour in many species of reptiles. It gives the animals time to retreat into their burrows or hiding places. The Exo Terra Light Cycle Unit provides a flexible lighting solution for your terrarium. Just mount the electronic ballast housing near the terrarium, and connect the fluorescent bulbs to the water-resistant end caps. The long, flexible end-cap leads allow you to position the fluorescent bulbs very close to the animals, necessary when UVB bulbs are used (ie: Repti Glo 5.0 and 10.0). The long end-cap leads also provide the versatility to mount bulbs over any type of terrarium, regardless of size.